I admire 37signals because they make simple, easy to use web applications and because of their unique perspective on business. 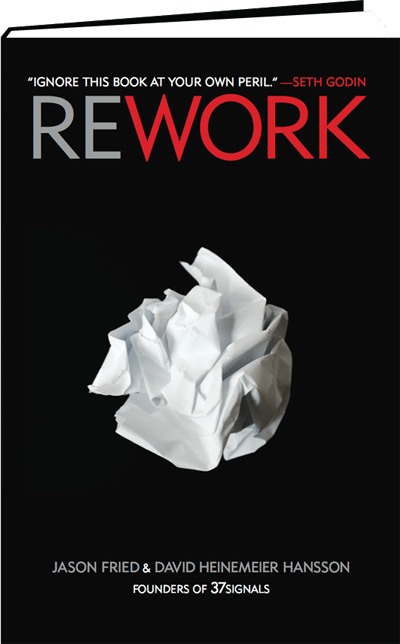 Rework is a collection of short essays by Jason Fried and David Heinemeier Hansson, focusing on doing less and embracing constraints. Jason Fried co-founded 37signals and David Heinemeier Hansson later joined the company as a partner. Jason and David frequently write and talk about their business philosophy on marketing, hiring, culture, and productivity. If you haven’t read their blog, Signal v. Noise, I recommend that you do so. If you’re looking for a business book on writing effective business plans or about strategies for finding investors, this isn’t the right book for you. Much of the advice in the book is contrarian to how most people think about startups and business. For example, while most entrepreneurs want to deliver more than their competition, Jason and David suggest you focus on delivering less. There’s a new reality. Today anyone can be in business. Tools that used to be out of reach are now easily accessible. Technology that cost thousands is now just a few bucks or even free. One person can do the job of two or three or, in some cases, an entire department. Stuff that was impossible just a few years ago is simple today. You don’t have to work miserable 60/80/100-hour weeks to make it work. 10-40 hours a week is plenty. You don’t have to deplete your life savings or take on a boatload of risk. Starting a business on the side while keeping your day job can provide all the cash flow you need. You don’t even need an office. Today you can work from home or collaborate with people you’ve never met who live thousands of miles away. The book is a short, quick read. The tone is confrontational and is far from the academic, dry tone you’ll find in most business books. It’s about 270 pages (the margins are fat and there are lots of pictures and white space). You can finish most of it over lunch. One of my favorite chapters from the book is about culture. Jason and David have long asserted that you don’t create a culture by defining it (I agree with this). Here’s the chapter on culture (in it’s entirety). Instant cultures are artificial cultures. They’re big bangs made of mission statements, declarations, and rules. They are obvious, ugly and plastic. Artificial culture is paint. Real culture is patina. A friend who has not read Rework but who skimmed a few chapters referred to Rework as a “fortune cookie approach to business advice.” I don’t agree. The brevity of the advice in Rework is intentional. The essays in Rework aren’t focused on giving you practical, step-by-step advice about what to do. Instead, Jason and David offer their perspective on business – a perspective that can change not only your attitude, but everything you do in your own business. Bottom Line: Rework is an outstanding book for anyone who wants to learn about a fresh approach to business not found in other business books. If you’re looking to shake things up and to follow a path rarely traveled by Internet companies these days, you’ll learn a great deal from this book.